Joseph is dedicated and creative; his talent for putting a case together for his clients is unparalleled. Joseph is a Partner at McLeish Orlando. He is a graduate of the University of King’s College, Dalhousie University, and Western University. 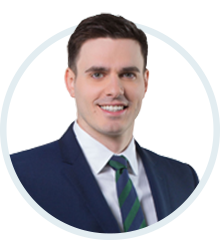 Joseph began his legal career as an articling student at McLeish Orlando in 2008 and has dedicated his practice exclusively to working for injured clients and their families. He has handled a wide variety of personal injury cases, for people of all ages, and has the expertise and dedication required to achieve a successful outcome, no matter how complex the case. A passionate advocate, Joseph strives to assist his clients in their recovery and in the pursuit of their goals. Joseph is known for his ability to empathize with his clients and their family members. He will patiently guide you through the legal process with efficiency and compassion. Joseph will work with you and your rehabilitation team to secure your future. When your case is resolved, he will remain available to answer any questions you may have. Outside of the office Joseph is busy trying to keep up with his daughter and son. He is an avid cyclist, a DIY enthusiast, and frequent volunteer. You have worked so hard for me over the last three years and I will never forget you all. I feel like I will get somewhat of a new start on life hopefully. I have to stay positive that I will not have to have another surgery. I would like to thank Kimberly for answering all my questions and also for all the positive thoughts and taking time for me. I am going through a lot, but I have great friends and family that are helping me through it, but now I have a new house to start new memories and I will always be thankful. Thank you for all your support and efforts over the past few years. We appreciate the expertise and hard work from the McLeish Orlando team. Blog: Vision Zero: What’s Next? Blog: Fracture vs. Break: What’s the Difference?